18 years old, height 175 cm Weight 62 kg. There's a smile that makes everyone happy. A little dream. I can't be angry with anyone. I'm weak. Height Part 185 cm Weight 70 kg. It's a mysterious looking guy. Smart and aware of everything. Read the mind. There's a gentleman keeping words. Pay attention to details. Very good memory. And also a man of many people's dreams. 19 years old, height 178 cm Weight 65 kg. Personality - a young character. A bai. The athlete is a straight man. Our fourth character today, the "Guide" close friend of runway who is also confused and hesitant about love. He will be another young man who comes to create chaos in this series. 18 years old, height 178 cm Weight 65 kg. Personality - the habit of for does not like to be alone. Like to hang out every day. The study is not very interested but good memory. Here comes the summary of my dream the series ss501 after this will come to tell the story in each EP. Let's follow each other again. And keep up with various channels. P'Dream : " Hey my little boy"
And what is that, kkkk Rick RI? I'll come and get the picture behind you. Admin is a kind girl. I'm going to have a photo of the moment. Let's go to the boat too. Let's go to see the photos from all channels. Who has you in a dream? And who ever gets to be with you in a dream that's not just a dream? 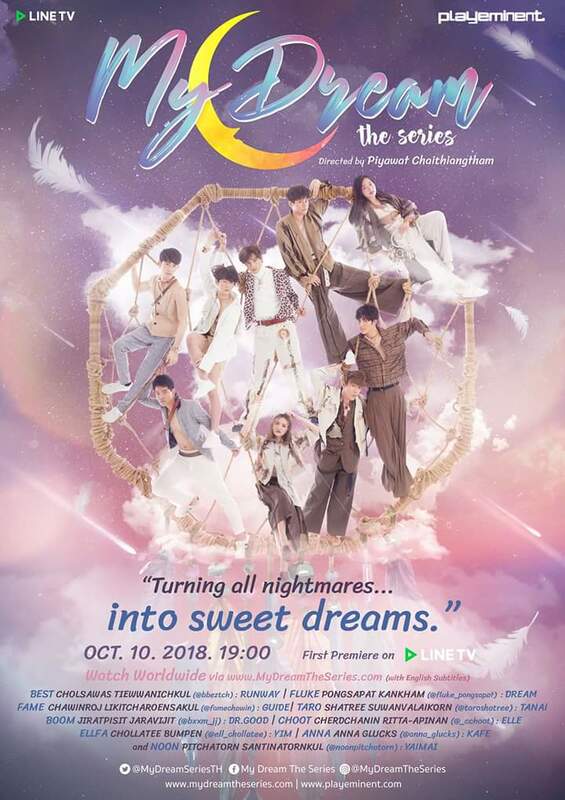 You dream of my dream the series series that will make every dream come true. Follow to read the story that will be made as a series to watch this year for sure. Have you ever slept and have nightmares?
" Papa that was my voice, boy runway. That time I could have been about five years old. I was running playing with dad in the vast pastures. Green that cut with the bright blue of the sky. There are clouds floating in various shapes. Dad will Like me to ride my neck and open my arms until the end of my big arm is holding on to my wrist and taking me all over the fields, similar to me flying in the sky. "what plane... say follow dad, plane"
" Runway wants to drive a plane like a papa dad, I'm a pilot. Spend more time on the machine than stay with me. In a month, I remember I met my father for more than five days, but it didn't make a commitment. My Dad and dad are down, dad is still like the one who lit my dream, so i want to be a pilot, like my dad, nod my dad. "like this.... the plane is flying, then" Dad made himself a plane by giving me a neck ride as a driver. Dad took me to fly all over the prairie. It was a moment when I felt fun and happiest to be with dad but happiness. It's always been with us not long ago, the nightmare was stacked. "Papa" in my dream, I stand to call my father in the middle of the forest, which is all the same. I walk without a destination. "Papa.. came out" I tried to call my dad out. Dad was trying to find a way out of the wreckage. I cried. Fluffy was going to walk to dad, but it was stuck in front of me. There was a stream that came to block.
" don't come, son... I'll be right out. I'm still trying to push myself out of the wreckage of the plane that's been pressed. Dad moved around. It seems to be slowly coming out. I'm still crying, watching, watching dad with hope. Dad's Last time, the father's body fell out of the wreckage, the father turned to smile for me. I smiled at my dad, but then suddenly there was a blast, the flames were flooded around the area where dad was. I was shocked, but I was screaming at the end.
" Mom, what are you doing in the dark here the dim light makes me not see my face.
" I was thinking about work. I was going to go to bed, and we...." mom asked me back with a doubt. I sigh, softly, as.
" nightmare again, son I told you about my dream. I nod my mother's answer.
" let mom sleep as a friend I'm in a hurry, smh. "once in a while, I slept with my mom every night. When I was a young man, I wouldn't sleep with my mother." I can only smile for mom. "then I go to bed and go to bed." Mom got up with a walk and rubbed my head.
" richard simmons... don't tell me, you're not awake? Damn... it's going to be a couple. We reported it. " the sound of my best friend guide makes me cringe. Wake up from a quick sleep. I look at the clock on the phone. the pa is in nine. It's half and I'm in a hurry. Let's go to the curtain, the balcony, walk out, look at my front house, which is now a young lawyer, a sports student, year 1, a tight body in the house, next to caddy, the phone is on the motorcycle, big bike, the big one, The way I fit, the lawyer smiled at me before I could talk to me.
" yeah, I'll be right back. I'm going to cut off a guide friend who still complains, doesn't stop before pressing the phone. "brother, wait for a second" brother na, nod and smile as a response. He should have been waiting for me for an hour. I'm going to walk back to my room.
" Mom.. Whey went to study. I looked up to my mother's room, but I didn't have a voice, so I ran out of the house.
" sorry, brother... wake up late..."
" yes brother lawyer handed me a helmet. I don't wait to wear it and hurry up in the trunk of the lawyer. "a tight hug" can't talk. The lawyer started the car, twitch until I almost missed the bus, but it was good that I grabbed my brother's waist, so I had to hold my brother's waist tight. It was tight. Motor bike left in front of the house, but My Mom was watching me in the window in the room earlier, and my mother's face was so dark, my mother stood up and looked out in the sky. In the midst of a busy road in Bangkok, brother lawyer tried to ride a motorcycle, took a shortcut to the speed of my hand, still hugging the waist of the lawyer's brother tight, the hand that started to soak up my hair, touched the richard simmons-up body of brother lawyer. The warm that passed from the lawyer's brother came to me, it made me start to feel weird!!!! In my classroom, I am now in serious tension. Two classmates are standing in front of me. Teacher oi, the science teacher, pay attention to the friends who are reporting, different from my friend guide, who now looks hot, anxious to watch. The door door is periodically. "next, your couple. Hurry up and come back for a minute. I'll let you both fall." the front guide is broken, walk out of the room and pick up a cell phone, call me, I'm as fast as I can. I didn't get a phone call. Not answering my calls, the more hot it is, it keeps walking around in front of the room like a crazy person. Lunch break within the school canteen, the guide and I walked down to our regular table. We left in the chair like the one who released everything. It felt so relieved. "richard simmons, you are so bad.... I shouldn't have been a pair of you, but first" the guide still scold me, I don't stop. I feel guilty until I give up everything.
" I'm rich, I can buy it myself.."
" what did you do..."
" I dream about dad again when I talk about dream, it looks like the guide has an understanding. ",... I think it's weird. How can a person be dreaming like this every night? " I don't understand why I keep dreaming like this. The two of us look at each other like people. Who wants to answer what's going on, but no one can answer us.
" Whey.. The Guide.. the familiar voice of the smile, the boy, the glasses that are so annoying, it's our other best friend, but it's too lazy to go. Sigh.
" I'm a richard simmons. I'm late. I almost finished studying.
" richard simmons ' smile, you're going to point the point again. Why is the guide so angry with me?
" ah... someone gave it to you..." a smile that gave me a chocolate sticker that sticks my heart. "who else is it? It's your fan. It's a cuddle-day drama. That's it." the smile turned to the group, Juniors, three girls sitting with the other guy who sat around. The guide looked at the cute little girl. "that little brother is so cute." the guide turned to ask the smile with curiosity. "not" smile, smile wide to the guide. "the guy's brother who turned his back on the back." smile, laugh, happy, I look at the brother who is now looking at me. White face in the photo. Thin and thin. It seems to be quite good, but look at the look. It should be around a lot. 4, a man smiled at me with an attitude. I smiled. I answered with respect. The man was rushed to turn away immediately with the shyness of the friends. The woman took cuddle to make a noise, but suddenly there was a gang of three girls. One of them is a The Guide of the guide came to the table of the sisters. The two girls smashed their hands on the table. Sisters take each other. Don't be cheap. Look at your face with serious posture. "that table of brother... don't think to be busy" sister in the table, sit down, don't dare to make eye contact, and friends walk straight to my desk.
" Silk does the guide smile to the silk, show the ownership by walking to sit down next to the guide, and the other two girls are going to walk with me without anyone interested in smiling?
" Let's eat again... I can go alone. I'm not upset. "sorry.. Let's go tomorrow, the guide is empty"
" Let's see each other again fiber, get ready to go before you look at the two girls who are trying to clea me. The sound of the rod quit school, the three of me walked out in front of the school.
" I ask for your car to go down to the tree's house.." smile, hurry up and talk. Brother Goode is driving in close to us. Good brother, reduce the mirror, car, hair and smile. Raise your hand. "good evening, brother Goode" Brother Goode.
" Papa... get in the car... the guide and the smile walk in the car.
" see you tomorrow the guide told me before I walked in the car.
" Hey, Whey, don't go together.. I'll send you..
"it's okay, brother Goode. Thank you." I rushed to say no to brother Goode. In a sudden, the lawyer was riding a motorcycle in front of me. It was raw. (I can't wait for them to go first). The Guide and the smile in the car Seeing a lawyer, riding a motorcycle, doing a lot of things.
" Vincent, it's picking up. You don't have to worry about it..." the guide speaks to me. "this is a normal person, brother... this morning I saw it to send mam.. morning delivery like this.. Pay with what," the smile, the seat, the back seat, offer the face to reduce the mirror, to annoy me.
" what the richard simmons, smile look at it. If anyone sees it, you want to jump in and kick it for a few times. Brother Goode is like a smile. Enjoy them. "Let's go, brother, it's a little bit" the guide let my brother drive away when it sees my grumpy face. I can only lift the middle finger to them, but they close the glass, the car doesn't care, leave the angry feeling, I need to hurry up. At the outlet, I turned to see a lawyer with a smiling face. Happy.
" smile, brother I'm in a hurry to find a lawyer who seems to be happy that my annoying friends are teasing. "it's not funny, it's not funny." the lawyer said it, and he gave me a helmet.
" no... I won't be able to go back by myself. I didn't tell you to pick me up. I'm not interested in anything. Hurry up and walk away. "What's wrong... this morning is still good." Brother Lawyer, riding motorcycle, following me. I keep walking. I don't care. "going up good or holding" I stopped when I heard what the lawyer said. I didn't do anything. Try to find a reason not to take a ride with a lawyer.
" What's wrong with you, so I can pick up the whey, take care of the whey the look of the lawyer's eyes look serious and full of gentle feelings, similar to begging, asking me to sympathize with me when I see the eyes of a lawyer like that, with fear of Follow me. Need to change the subject. "don't change the subject" like brother, the lawyer will know I'm trying to change because I'm not set up with my lawyer's words.
" go back, go, go I give my hand, ask for a helmet from brother lawyer. The lawyer hasn't filed a hat yet.
" I'm going to take the whey, okay? I can't do anything right. I feel like I'm a fragile woman who is getting a little girl. I'm so young. I'm going to have to be soft.
" going back to the?
" go back brother lawyer, hurry up and give me a helmet.
" a tight hug like this morning my lawyer didn't finish my hand. I went to slap the lawyer who still wears a helmet.
" stir the nerves first brother lawyer seems to be happy with my nerves without him knowing that I have left my feelings, confused, chaotic, and I don't know how to act, which I am now dying to die. The Sun is falling. I walk back into a quiet house. Suddenly, my past picture came up, it was my picture after it wasn't long. I was staring at the balcony, which dad was dangling a nightmare trap for me to look at the trap. The dream that the father was dangling, it left to follow the strong wind.
" the following, my son will only have a good dream the voice of my father is in my head. I suddenly got a little loud, got me out of the palace, the mother moved a little before sleeping in my hand, still holding the nightmare trap. I was slowly packing, playing other pieces, putting it back in the box, and putting the box to keep the same place. I hold the A dream came up to the mother's bed and slowly pulled the blanket cover for mom before walking out of the room. I came back into my own room, walked straight to the balcony, with a trap, a nightmare, hanging in the same place, where my father was dangling. Let me stand and look at it for a moment before I walk back to the room, to the eye, to sell, dream, Come on, the wind outside the window from the cold light becomes dark. There's a lot of stars floating in the sky, far away, purple feathers from a dream trap. A gust of wind fell down to the floor of my hand. Reaching out to pick up that feather, which I am The Set is going to sleep. I look at the feather for a moment before I hold it. Walk to the book cabinet with a lot of books. Because I'm a person who likes to read a lot of books. I picked up a book that was about a group of stars coming out and In the face of the book, then I kept the book at the same place before going to look at the model of the father's plane that bought me as a gift. I was still looking at it for a moment, steamed before walking back, falling down on my bed. I felt like I And want to sleep for a long time, I slowly close my eyes, light the moon, shine on a nightmare trap, suddenly the nightmare trap is like shining out.
" who I sit still staring at the back of the man in front. "why don't you answer the richard simmons" I'm brave, scared, trying to move around. After dad put a nightmare trap in the room that night that made me get to know brother dream!! I'm still sitting in front of my brother's face right now staring at my face in the head, trying to think of a memory that I remember. "growing up a lot, little guy" I got off the trance, trying to get back on the wall. My room didn't do anything right. It was all confused.
" scared the expression of my face is like a disappointment. I'm still going to be in the wall. I don't answer anything. It's like I'm missing. Sitting next to me in the bed. "if you scare me... then you can go." brother. is facing away. Acting like she's really going.
" wait a minute I suddenly slipped my mouth, forbid my brother.
" is this a dream or a real thing?" I'm confused and I feel weird. I suddenly come to see something like this. Oh, my brother, dreamy.
" then... close your eyes... I hesitate for a moment before I close my eyes, according to my brother.
" mom..." it's me. When I see my mom crying, suddenly tears are flowing by my mother. So the mother tried to wipe the tears not to flow, but it still flowed. No, stop, I walked in, would have touched the mother's hand, but it was Useful. Now I'm like a soul that slips out of body. Can't react to anyone. There's only a brother. Who walks closer and catches my shoulder gently. Suddenly I show up to hug brother dream like a little boy who needs someone. Now, brother dream, but pat my head gently to comfort me. The alarm from the cell phone was ringing so many times, it made me cringe, I slowly opened my eyes, fighting the sunshine that shines through the curtain, the balcony came into my room. My feelings are now like I just slept for a few hours. I've been thinking about the last night Bed and walk. Open the door. That beat. Mom is walking up the stairs. "wake up... Mom made a sandwich for you." Mom saw my face smile, which mom now and last night was so different. I tried to keep the sad feeling alone, not showing me.
" Whey Love you mom mom stopped, but still turned my back on me. I can feel you trying to keep your feelings inside.
" Mom, what can I tell you? Don't keep it alone. You slowly turn to me and wipe my tears.
" there is nothing... we have something to do with you..." mom is still trying to cover the feeling and make me see that mom is strong. I wipe my tears and try to smile for mom.
" hurry up and take a shower... I'll be late for school.." mom changed the story to make me stop crying. I looked at my mother's face with concern. My mother nodded told me to take a shower. I turned my back on the door, went back to Look after me, when my door closes, what my mom is trying to cover up, now it's all over the tears, mother flows, the Pluto comes out. On a hectic road, two people on the road who are hustling with going to work. I sit in the back of the bike, the motorcycle, the lawyer, the eyes, the eyes, the eyes, look out on the street in the head. I think a lot of things that have been Look at me through the side mirror with a motorcycle concern, parked in front of my school, taking off my hat and getting off the car.
" thank you I filed a hat for brother lawyer, brother lawyer, caught my wrist.
" What's wrong... is it sick? I look at the hand, the lawyer caught my wrist. The lawyer slowly let go of the hand. "No, brother, let's go. I'll be late." I'm finished, I walk into school. "wait for the evening. I'm coming to pick you up." brother lawyer yelled after me. I didn't answer anything. Let the lawyer know what I am. The look on the face. The lawyer looks so worried about me. But what can I do? It's the day I I was so tired and exhausted, the lawyer rode out, suddenly a strange dress girl walked up to stop where we parked a moment, and looked at the car, the lawyer who rode out before he turned around, looking after me walking into school. Her posture seems to want something!! In the classroom, the voice of master science is teaching about the universe and the stars, but in my head, it does not hear the voice that master is teaching. I am still., looking out of the window, classroom, thinking a lot of things in life, but then suddenly my eyes The guy who was standing in the middle of the lawn staring at me, I turned on the left looking right, trying to find out who she was looking at, but anyway, I felt she was staring at me. I turned to the guide. Sleeping on the table, studying my face, I picked up my cell phone, printed a message, sent line to it. "you, the girl standing in the middle of the field, he looked this way, right?" I sent a message, but it still fell asleep, so I picked Drop it. Hit it on the back of it. the cringe guide. Wake up.
" Mr. President.. If I see that you fall asleep again, I will fire you out of the room. The teacher looks at the eyes, the guide can do it, just smile to the teacher before looking at the hammer on me.
" wake me up the guide turned to me softly, but the tone was full of anger. I pointed out the cell phone to read the text, the guide picked up the cell phone, read and turned out the window before turning around, looking at me with a doubt.
" where's your girl I turned out to look at the lawn again. Now there's no woman standing. I look at the face of the guide. It's a little bit of an act before turning around to sleep in the table. I turn out to look outside the window again. With a doubt before I turn around, think for a moment, but then my eyes are glimpse of the same young lady standing outside the classroom staring at me through the classroom door glass. When I eye her eyes, she quickly walks away. Leave a doubt for me. After school, I'm a guide, and a smile on my way out in front of my school.
" What's wrong with you, Wray the smile asked me to come up with a doubt. I stopped walking and thought for a moment.
" I think that girl is looking at me weird guide and smile. "but I really see you, you're going to be a little high, dress weird," I try to describe the shape of your face and dress to them. The Guide and the smile say the garden.
" wear a long brown dress with fur and wear black glasses. I look at them and nod them.
" yes I looked at the sight of them looking at someone behind me, I turned to see the woman who stared at me standing behind me, shocked, retreated immediately.
" Hey I jumped in with the smile and the guide, she still stared at me.
" who are you the smile asked a young girl, but she didn't answer anything, so the smile turned to me and the guide, what to do, which is two, I don't know what to do.
" you're a fan, isn't it? The smile pointed at me, and then the girl smiled and nodded for the smile to talk to me and the guide. "Fan Club is like this. You like to have something strange." the smile is finished, ask the girl in front. "I have a thing for you to use." the smile is finished. The girl smiled and nodded again. The smile turned to whisper to me. "what did he give you, take it first...."
" where are you going to give a girl a hand in my pocket, I still dare to scare, she suddenly cut something out of my hand before I put a hand in that hand, but she's still holding it tight. A smile and a guide to look at me, they nod me to the hand, pick up the stuff she filed for me. Slowly, the bass filed to pick up the stuff from her. Now my hand is a little shaky with fear and wonder what she's holding in hand. What is that, she gently put his hand in the ring, the weird look of the blue stone fell on my hand, I stared at it with a surprise. The girl in front of me gave the stuff, she walked away from us without saying a word. Let's leave it to the guys.
" There's this thing the guide is heavy with behavior just a moment. "sorry, quit a little late" Brother Lawyer, look at the three of us who are still confused with what happened just a moment.
" What's wrong with you the guide, the smile, turned to smile at the lawyer, like nothing happened. I was in a hurry to keep my ring tight, not answering anything as well.
" I'm leaving first I picked up a hat from my lawyer.
" yeah I'm up in the trunk. Brother Lawyer's lawyer is still confused. "Let's go first" brother lawyer wears a hat and ride a motorcycle out, a smile, and a guide to look after a car that's shits out of sight. The smile turned to ask the guide.
" do you think it's the two of you the guide to look at the smiling face. "will I know? I didn't go to the two of them." suddenly, the car is good, the black one drives near the fiber. Lower the car glass.
" I'm going first the guide walk in the car with the silk. Leave the smile to stand alone. "I have a boyfriend. I am alone." the smile walks home with a sad reaction. In the bedroom, I was lying in the bed looking at the ring received from that puzzle girl. I tried slowly wearing the ring to the finger, the finger, the left, I was wearing it. I was surprised why the girl knew my finger size. The more I wonder, the bigger the noise, the knocking on my door, the louder I get up, trying to take off the ring, but it can't take off.
" Mom in. I hid the hand that put the ring in the back. Scared Mom saw.
" come on in. Mom holds a glass of milk in my bed.
" eat and go to bed. Mom walks in the bed next to me. Now the facial expression looks brighter than ever. "thank you," Mom looked around the room before going to stop looking at the balcony, the room with the nightmare nets dangling.
" still having nightmares mom turned around and looked at me. I thought for a moment.
" not really a nightmare, but I didn't dream about the same thing. I smile before I reach my shoulder. "you have a good dream. Mom turned to smile before I close the door. I feel more comfortable because I feel like I'm going to be better. Suddenly, the message on my phone is ringing. I picked up the phone. It's a message from the lawyer." are you asleep If you don't fall asleep on the balcony, I'll just walk out to the balcony with a doubt, a lawyer sitting on the edge of a balcony in a cell phone, a lawyer, a lawyer, pick up a cell phone, type a message to me " brother. Let me play with you before I go to bed. " I read it and I look at the lawyer before I nod. Let me sit down on the balcony. Look at the lawyer who is starting to snap a snap at the ki. Just a first neck at brother. The lawyer was good. It reminds me of the first time I met a lawyer. The story happened in one night that I suddenly heard someone playing a manta on the side of the house, walking out, looking at the balcony. I remember that time I was in the middle. 3 part. Brother Lawyer. 4 brother lawyer in a student uniform is sitting on a song. Some music that sounds familiar to me, and very nic, which the lawyer doesn't know I'm listening to. The fact that the lawyer's lawyer is so cool. So much, it makes me want to play Santa as a lawyer. The lawyer hasn't finished yet. There's a voice of dad yelling louder.
" Dad, the lawyer was going to walk in the room, but he suddenly turned to me. I was looking at it. Shocked when I saw the lawyer, turned around and smiled at me. I was going to have to go to the room. My lawyer smiled so funny. Walking into my room, sneaking my face out. A new morning, I was going to school, saw my mom standing up to the parents of the lawyer, he bought a snack for mom, and it was getting to know each other as a new neighbor. Mom called me closer and introduced to the lawyer brother, then I, the two of us It's been a long time since we've been getting closer. Sometimes I like to go to the lawyer to teach me how to play home. Sometimes the lawyer will be sitting at my house until my brother lawyer is up. 5 Dad and brother's mom had to go to Bangkok Phuket because they were building a resort there. Mom and dad, the lawyer gave it to my mom to take care of it so far, but when the lawyer started to go to college, I didn't get to go. Brother Lawyer's house, brother lawyer doesn't come to my house as usual. Maybe because different people start to grow up, start addicted to more friends. But what the lawyer is still doing, the consistency is to pick me up at school, and I never thought of a day. One, the lawyer will come to say like me, because a person like a lawyer, a good-looking, good-looking, good education, before seeing, a lot of women can choose so much. Why do you care about me and important? I'm a man too. But now I To the sound of the Santa that his brother played for me. is this a man like a lawyer playing with me? Oh!!!! I'm lying in bed, reading the line message on the phone that the lawyer sent me to think of. I think about it again. "be a fan. When you're ready, you can answer. Sweet Dream" and followed by sticker. Send me a kiss, but keep calm. Read. Don't know how to answer it. It's all confused. It doesn't want his brother to like others. Because if he has someone else, he may ignore me as usual or disappear from my life. But another heart is not ready to be a fan with a man. Together I still feel weird or I think too much. Oh!!!!! I put up with my own thoughts, not paying attention, reaching out to turn off the head of the bed and trying to smother my eyes. I slept and rolled in for a while. I fell asleep, but who knew it was harder than a lawyer. There's still a brother who's waiting In the dream, and then the beautiful piano voice, the one who was sleeping, the one who was sleeping, woke up, woke up in a white room, there was a cloud floating around, a trap, a nightmare, dangling all over it, it was the same place I was dreaming of Yesterday, I was looking for the sound of the piano in the corner of my brother's room in the original dress, sitting on the piano, which is the most beautiful piano sound I've ever heard. Falling down, going to sleep again, but then suddenly the piano sound is loud, not the same as the one who's angry. I'm out of the middle of the k. I'm looking at brother dream. I'm turning around with doubt.
" that was good I was kind of looking at how brother dream would react. "it's not as good as the sound of a kiki." all right, why do you have to sound ki or..... how do you know? Why do you have to be sarcastic like this? I'm still stunned. I don't know if I'm going to answer. How? Let brother dream feel good. "piano is because" I answered, hoping for brother dream to feel better. "then between the piano and the ki, what is it?" found this question. I don't know what to answer. "because of different things," Brother Reid turned around to look at my face serious.
" then like the piano or the ki the question is heavy. I don't know what to say now. "like...." I hesitate to answer out. Suddenly, brother. said it. "no need to answer. I don't want to listen to" Finish it. Brother Dream is missing. "hey.. Brother Dream...." I'm looking for brother dream around before I move to the end of the bed for sure.
" What's wrong with you I didn't understand what brother dream was. I was thinking for a moment, but then suddenly brother, appeared by pushing me to fall down in bed and then came up. Stay on me before slowly face down to me like a kiss.
" let go of me..."
Mom walked by in front of the room, heard my voice, so I knocked on the door. "Whey is a child... Whey" but there is no sound in the room. The reply came out, so mom slowly opened the door. Mom looked at the bed where I was lying inside the room. There was only a second dim light through the balcony. The room came in my Being in the bed, the shirt is flayed to the chest, until it reveals my white belly, I squirm in my bed, and I walk around, pull my shirt down, put it down before I sit down and reach out to my body.
" nightmare again, son I tried to pull my mind back before I nod my face.
" let mom come to sleep as a friend mom still looks at me with concern.
" What's the call for mom I nod my mom to walk out of the room, I hurry to close the door, I turn back to the bed and think about what happened. ***** suddenly brother. appeared by pushing me to fall down in bed and then came up on me before slowly bowed down to me like a kiss.
" hey brother... what are you playing? No!!!!!" I tried to squirm to get loose, but I couldn't fight with my brother, so I closed my eyes and turned my face on the back. At the end of my life, I had my wrist on my wrist, and I kept pushing it, trying to keep me from squirming my brother's face, scrolling down, until I was in the middle of my head. I'm going to have a hard time. I'm going to look at my face and smile at me. Look at brother dream back with my eyes. I beg you to fall down and use your mouth at the end of my shirt. Still holding my wrist tight, not giving me a cuddle-Year-old, my brother's legs are over, asking me not to move anywhere, and then brother dream is slowly using the mouth at the end of the shirt, the shirt is slowly skinned, so it reveals it. My White Belly, the shirt was flayed to the chest, and then the you slide the face down to the belly area. I started to feel unsafe, then begging brother again again.
" let go of me..." then I flinched. Wake up.
" damn brother... what the hell are you doing? I can't stand to think about brother dream and can't starve. I look outside the balcony. The room sees the trap. The nightmare that is dangling is being blown away. It's like it's going to fall out of the wind, so I'm walking to open the porch door to catch the nightmare trap, because I'm afraid it's going to blow away, but then the wind that blows, it just stops. Stop it. I stared at it with doubt before I looked down at the front of the house with the same young lady standing up to me. When I eye her eyes, she smiled at me before walking away in the dark. I looked at her too. Doubt, then suddenly the ring I was wearing was shining. At the school of the morning, I was sitting at a stone horse in the condition of the,. The guide that walked with the girlfriend's fiber. When it saw me sitting alone, it stopped looking at me. "Wray" I turned to look at it like a whole person, so exhausted, knew that the guide would come to me, so i cut the cut.
" why is it so early today I turned to look at the face to make it look at my condition now.
" you have nightmares again I nod it.
" the nightmare is more scary than ever. I can't think about last night.
" what are you dreaming about me the guide is looking at me. I want to know. I told you about the dream and the mysterious woman. Close to the two of me sitting there, there are four students playing basketball, a boy threw a beautiful baby in the same rhythm, the same rhythm I told you all about the guide. The Guide has a facial expression.
" a man in a dream. is everything really real? and yet, the girl yesterday still went to see you in front of the house. I thought there was something I thought the guide said.
" what are you going to do I think for a moment.
" can't think of it the guide. Think for a moment before it acts like a thought.
" so, let's take care of the ", " thing.
" how the richard simmons I look at the face with doubt. The guide brought me to the front of the nursing room. It opened the infirmary door.
" teacher, my friend has a lot of stomach pain. I have to pretend to have my stomach ache like the most. The teacher walked in to help me. "come to the bed first" teacher and the guide brought me to the bed. "What's the pain and pain on the left or right side" teacher cuddle milk, ask me, me and the guide. Hurry up and answer simultaneously. "left sir" right the guide and I answer the teacher doesn't match each other. We look at each other's face suspiciously. The teacher is curious. "right, it's but left me, teacher" the teacher acts like believe before it's gradually reaching out to press straight where I say pain.
" hurt when the teacher press down, I pretend to cry that it hurts to be realistic.
" Oh, I'm hurt, teacher. I'm worried. "the right pain, press down, it hurts too. I think she should have a pain in the appendix. Must be quick to get out of the appendix. Otherwise, her appendix may break and die." teacher said, end of me and a shocked guide. Look at each other, we Fine. Don't go to the appendix.
" richard simmons, didn't you hurt your right side???" the guide, send me the zipper, get the joke that it plays.
" or is it painful for her stomach disease?
" yes, yes, teacher. It's a stomach disease. It has been stomachache like this for many times. It's a cuddle baht drama, isn't it?
" yes, I have a lot of pain. I think I'll get some sleep.
" did you have breakfast in the morning I nodded to the teacher, pour the pills, put a small glass of glass and hand it to me. "ah.. eat in, it will help to go to the stomach. Lunch break after meal. Eat again, evening after meal again." the guide is taking medicine from the teacher. I look at drugs with the posture. I don't want to eat it. The Guide tried to Slowly open the mouth, the guide, quickly shove the drugs into my mouth, I struggle to swallow the medicine.
" and after that, eat it on time. The teacher turned his back on the table, now I want to throw up.
" can I have your water I'm going to eat water right away.
" how to be realistic, you better lie down. I'm a bit of a jerk, but I have to do what it tells me to do. Sleep slowly, close my eyes, with that I haven't slept in the last night. I'm slowly going to sleep. The Guide picked up When I sleep. The Light, the hair opened, woke up in the white room, the same room where there was a cloud of clouds floating along with a dream trap. A lot of shops that were like floating around, but different was the bed that I was sleeping. It was a patient bed. I was slowly Sweep the eyes, look around the room to find brother dream, but I don't see anyone. My eyes stumble on him with a blue paper that fell on the back of my room. Slowly getting out of bed, walking down, picking up that paper. I flip the paper on the other side In There, there was a message written " sorry I looked at the message in the paper for a moment, saw it like someone's foot stopped right in front of me. I was slowly looking up, looking at the owner of those feet, the face of the brother who looked down. Me, with my eyes, begging, facial expression, feeling guilty with a little smile that sent me, it made me look like I fell in the spell and forgot about everything that happened last night.
" can you forgive me the voice of my brother, I pull my mind back before I stand up and stare at my face with a serious posture.
" no I turned my back on brother dream and walked back to sit down in my bed. I sat down for a moment, suddenly the piano sound louder. It was a very familiar piano sound. The Melody is familiar. That's right. It's the same song my dad used to play Me and my mom, listen, I turn my face to the sound of the voice, the image I see is the familiar back of the father in the pilot set, who is slowly putting his finger on the cuddle-Loop Keyboard. Intentionally, the nic piano reminds me of the image. In the past, my childhood was sitting with my mom and listening to dad playing piano. I was slowly walking around, dad suddenly the piano was stopped. Dad slowly turned to smile for me with a warm smile. Now in my eyes, shaking the tears. Slowly. Flowing out by the feeling, both miss, regret, and happy. I don't wait to show up. Hug Dad.
" Dad I hold my dad tight like I don't want my dad to go anywhere else. Dad reached out to pat on my back. Gently. I was lying down on my dad's shoulder. Tears were, uh, overflowing. "let go" brother dream slowly let me out of hug, but brother dream's hands are still holding my flow tight. Brother Dream, look at my face with a warm eyes. I'm from angry. Pam gradually reached out to wipe out my tears.
" you want to see your father?" the word of brother dream, it fits my feelings earlier. I miss you and I want to see you again. "I met and cried like this. Can I see you're happy?" the word of brother dream is so gentle and makes me feel like I can be weak like this.
" Brother Dream, I'm really asking you, are you a ghost?" I asked brother Dr. to go out with a confused feeling and really want to know what the hell brother is.
" what kind of ghost is this handsome I'm running away because of my narcissism.
" narcissism it's the sound of my mind that the brother. Came up with.
" no brother. replied with a facial expression. "think in your mind, you can hear" brother,, let me ask you again. It's serious. "what are you... people are not... Ghosts are not.. They will say that they are angels." I made a stir-up facial expression on brother dream, but I smiled at me.
" whatever we want it to be, I'm still in a moment. "do I have to dream about you every time I sleep?" I look at my face, I want to want answers, brother dreamy, small smile before pointing my finger at my chest.
" if you want to meet this place, you can see it, but if you don't want to see it, you can't see it. I think about what you said and look deep in the gentle eyes of brother dream. For taking care of me when the kids flashed on my mind. Brother Dream will be waiting for me to play with me every night after everyone is asleep. Mom, the whole day I lost my father, there was a brother who was always rooting for me on a lonely day and next to me.
" you guys go to my friend I pull two arms to follow me.
" go where the guide asked with doubt.
" I can't practice music smile, answer with serious attitude. "the guide, you go with me fast" I pull the arm, the guide, follow me, the guide, my face, the smile, the smile, the smile, and the smile. I ran after a girl in front of the school. The Guide is still confused.
" where are you going the guide look at my face with a doubt. I look around to find a young lady.
" over there I saw the back of a young girl walking missing the corner of the road. Quick, the guide saw the young lady immediately knew that I followed her. Why is the good car of the fiber drive to the front? Reduce the mirror and shout the guide. "Guide" but I didn't hear it because I pulled the guide's arm to run after the girl.
" do you want to send it to paragon the car of the silk is moving out. Me and the guide ran after a young lady to the front of the Beverly shop in the corner of a young girl walking into the store.
" are you going to follow I was thinking for a moment before nod to it, me and the guide slowly creeping out in the Beverly Store, the two of me tried to keep her from knowing that the girl's behavior was strange, she looked. The bread put in a tray that was placed on purpose, like never seen it before, but then suddenly she pulled a clear, filled the inside out, put the mouth into the whole, in front of everyone in the store, and not just one. The sausage bread that was laying all over her Take out the sausage, eat all the pieces, and she walks out of the store to look at me, the guide, and the others take a look at the face of what I saw, just a moment ago, me and the guide ran after her, a young lady walked along her eyes. Keep looking at the people around her. Sometimes she will try to follow the behavior of those people. I noticed she looked at everyone who was walking down the front, playing the phone without ignoring each other. The young lady looked at the people's phone around before looking at the phone store. Nearby, guys, I secretly looked at her outside the shop for a moment, she walked out, ready to hold a bag of phone that was holding in her hand, holding a phone, a machine, she looked at the people around, who walked by her, everyone still bowed down on her phone Come up and face your face and walk along the way, me and the guide, look at each other's face, with wonder, a young woman walking down the face, looking at the phone without ignoring anything, whether crossing the road or walking through the road that is a hole, she doesn't The two of me followed her to stop in front of a condo, which I and my guide were wondering.
" the condo that your brother is here the guide to the nod. "that's the same condo as my brother." the guide, the wonder girl walks into the elevator.
" up the elevator the two of me rushed to the elevator and pressed the elevator, waiting for the two of us to stand and see where it was going to stop. ",... the same floor as my brother. " the two of me look at the face, the elevator opens, the two of us get into the elevator.
" do you think it's a coincidence I asked the guide with a doubt. "wait, Whey, go back. You don't have to wait. There's no sign." I'm in a hurry to hang up. Brother Sand is in front of the school. It's not too long. The elevator is parked on the 18th floor. The elevator is The two of us saw is the young lady standing staring at the front of the elevator. I was shocked when I saw her standing. The elevator is ringing, the elevator is slowly open, me and the front guide, when I see a young girl standing at us.
" Oh, are you.. are you here? The Guide is pretending to talk to the girl. Still standing still, the guide looks at me like trying to find a helper. "well, let's do some homework." The Guide Guide to the room of sister Goode, the girl turns to the guide, trying to find the key card to open the room, but can't find it.
" I didn't bring the key card the guide said to me softly, not let the girl hear.
" what should I do I answer the guide with the tone in my throat. Two people look at each other, try to find a way out. The girl takes the key card to tap the door and open the door. The two of me are confused.
" do you remember the wrong room I asked the guide in doubt, the guide, the guide, looked in the room, and suddenly the cat came to the door. "not wrong... this is my sister's cat." the girl doesn't care about me and the guide. She's down to carry the cat and walk to the couch. I'm two. Look at the face. The Guide. Hurry up to call brother Goode immediately. "hello sir" Voice Brother Goode said.
" hey.. What are you doing in my room..
" what is wrong with you the guide asked the young lady with serious attitude. The young lady kept silent, no talk, no look at the front of the guide. The guide turned to look at me.
" is it a hint the guide asked me to wonder before going to ask the girl again.
" can you say that the girl smiled at the guide, but he still won't talk. The Guide is getting angry. "are you going to be so nervous?" the guide will walk near a young woman, look at the face, the eye guide becomes green, and then suddenly the guide is like something. Cuddle people are gone so hard that they fall down to cuddle and gradually. Float up. It's a weird thing for me. The Guide is getting scared. Suddenly, brother Goode opens the door. Brother Goode in a white shirt dress is making a facial treatment for customers nearby. There are female staff to help pick up the equipment. Brother Goode walked out of the patient room with his gloves off the same beat as brother Goode's phone went up. Brother Goode took his hand and picked up a cell phone in his pocket. Looks like a call from the guide. Brother Goode, press the call.
" where did you get the girl in the room the sound of the guide went through the phone.
" hey.. What are you doing in my room.. Brother Goode asked me back with a panic. "hurry back, or I'll call you." the late voice from the guide looks serious. "yeah, I'll be right back." Brother Goode hung up and rushed to the clinic of the clinic with two female employees sitting. "hello, doctor" the staff didn't say hello to the end. Brother Goode, hurry up and open the door. Let the cuddle people look at the face. Brother Goode drove down the street with a rush to stop at the red light, and suddenly, brother Goode thought about the first time she met a girl. *** Brother Goode has been parked in the middle of a rainy night in the rain. Traffic Jam in the windshield of the car, swipe up and down to the mirror. The driver is full of water flowing from the roof. It can't be seen outside. It's not clear. The It's not far from where brother Goode is parking so much. Brother Goode is looking around the car. The eyes of brother Goode stop looking at the outside of the mirror. The driver who suddenly looks like a shadow in someone's blue dress walks in. Stop at the mirror. Slowly using a hand-to-hand at the island, out of the mirror, to reveal the face of a mysterious woman. Her eyes are so looking. She stares at brother Goode, the condition of a young woman is soaked in the red light, counting down in seconds. Good morning, look at her with doubt, the rain continues to fall down, the young lady is shaking, the grey brother decides to pick up the railing that hangs in the back and walk down from the car, heading straight to the young lady, before taking the shirt, covering the young girl and Change to the green light, the car, the car behind the honk, chasing brother Goode, running back on the car before driving away with a trance. Young lady still short meat, brother. Reached out to light air before asking her.
" where is your house.. So I can drive you right.. the girl is still sitting, brother Goode, looking at the seat belt with a worry.
" can you put your seat belt on first the young lady doesn't care that brother. says the meat is shaking. She close her eyes, brother Goode, broke the car to the side of the road for a moment before reaching out to pick up the seatbelt on the girl's seat, but Paper, pen, coin, bag suddenly floating up above the floor. Brother Goode is looking open with surprise. The honk from the rear car made brother dream out of the idea, looking at the green lights, then rushed out. Brother Goode parked the car and ran into a hot elevator. The elevator was parked on the 18th floor. Brother Goode ran out to the room, opened the door, saw the coffee, was doing something with the guide. "what is this, brother Goode" me and the guide, look at brother Goode, with curiosity and need answers. Brother Goode is hesitant before telling me about the girl. The girl was lying on the couch, there was a lot of wind blankets, the cat of brother Goode, stood up, threatened to put a little girl in the bed, like he was afraid of something. Brother Goode was cooking in the kitchen, heard the cat sing louder, and then went to Brother Goode came to see the couch, didn't see the girl lying there.
" o..." brother Goode tried to look for Oleg, according to different angles, but didn't find it. The voice of Oleg Yong came out of the bathroom. Brother Goode, let's walk to the bathroom door. "O" Brother Goode saw a young woman standing around. "uh... sorry. I don't know if I'm in here." Brother Goode, turn around. "she ate o" Brother Goode came up with a panic. The girl looked at me like I didn't understand why I was shocked. Time passes at the dining table. The rest of the porridge cup is on the table near the three-Pack Sausage Pack. The young lady is eating a delicious sausage at the sofa. Brother Goode is sitting to wipe out the o with a stain of saliva. It's like the green jelly that's coated on the violet's body, it seems to be a bit disgusted. "a little bit is not going to make it, Mr. O" the girl turned to see brother Goode and suddenly smiled at brother Goode. Look at the face with a doubt. "so.. does she have a name?" the girl is looking at brother Goode before picking up the sausage. Continue to eat. Brother Goode, think for a moment before looking at the olenna who tried to lick his hair. "Coffee, we call you coffee and" girl stop eating and turn to brother Goode. "yes.. the coffee will be similar to Oleg Yong, and you can't eat o again." the girl pointed at himself and pointed at the cat. "don't eat" Coffee, try to talk. "eat" a young girl doesn't understand. Brother Goode is like tired. Will explain to you. "is it true? I can't believe" the guide. The guide still doesn't want to believe what brother Goode is.
" then what the richard simmons is that the guide turned to me with a heavy doubt.
" I'll know. I've seen this. I don't know how to answer it.
" did I go to see the fiber first, you go back it told me to finish, and then I waved at the taxi and took a ride. I stood by it for a moment. The lawyer called in again, so I pressed the call. "stay condo brother Goode is going back"
" what are you doing and how to get back?" "don't be. I'm hard. I can go back." "say no, that's it. The Battery will run out" I'm quick to press the phone. At the end of the line, brother lawyer stood at the balcony of his own room.
" Hello Wayne... richard simmons... the lawyer is worried, sigh gently before looking at my balcony, and suddenly there is a light, like a firefly, but brighter than it is light out of In my bedroom, the lawyer looked at the wonder. At the balcony of brother Goode, the coffee stood staring at me for taking the taxi out. Brother Goode walked out of the bedroom to stop looking at coffee with a doubt. ",... come to me at home. The Sound Guide is like people are crying.
" you hurry up it's finished, just hang up.
" the guide...." I don't feel comfortable. Hurry up to tell brother taxi to change the new destination. "brother, bother to raise right in front and change to the substitute." I hurry up to pick up the phone that is now the battery left two. Sign up, call mom.
" hello.. where are you..
"wait, Whey, sleep at the guide house, mom"
"oh... why don't you come back to sleep at our house... richard simmons" phone cut. I look at the phone. Mom, the seat is clear on the couch, wondering how much you try to call me, and you look up to my room. In my bedroom, the lawyer was slowly walking closer to the ring of the coffee that now it shines. Cuddle baht. The lawyer is about to reach out to the ring. Suddenly, the knocking on the door is louder.
" it's me brother lawyer rushed his hand back to look at the door. Mom opened the door. "which one is this? Sitting on the wine by the pond." the guide turned to look at me. The eyes are very similar to crying.
" this symptom is broken, isn't it.." the guide to the nod again.
" What's the story the guide turned to my face like someone who was wanting to vent something to someone and needed someone to comfort it, filed a glass of red wine that just poured me.
" eat my friend first I hesitate for a moment before I lift the glass and drink it all.
" did I find a fiber with someone else a guide, a serious act, a shaking tone, I slowly fell down next to it, my head and its head hit each other.
" you know, it's my first girlfriend. I'm a fan. Since the third time, it's going to be three years. Why are you doing this to me? I'm so richard simmons sad when I see it. Man, I want to walk in front of my face..... but if a woman doesn't play with a man, it's going to be busy. I don't know what to do. " the guide, the mattress, the sky, trying to hold on to the tears that are so Look at the face. It's worried. "I don't know how to comfort you. My boyfriend never had a broken heart. I never... Let's say that if I'm right next to you and make you feel more comfortable, you don't have to think about it." Facing my eyes, tears in my eyes, I reach out to wipe my tears, it smiles at me. "thank you for being my friend. You are such a cute friend." the guide smiled at me. The two of us looked up in the sky who saw a few distant stars. We were both asleep by the pool without knowing that brother. Reese is staring at us two. Brother Lawyer standing on the porch, looking at my front house, switching and picking up my cell phone, looking at the message sent to me. 19.59 am Wait at home. 20.15 am What's wrong? I'm worried. The pool of hair and the guide was still sleeping, but then suddenly there was a similar voice. Someone went down in the water, did the hair flinch, woke up, I was slowly getting up, looking at the pool, the image I saw in the pool. The young white man in the A beautiful look, I look after my eyes until I know that the man is brother prim, black brother down, lost in the water. I tried to look for, but then suddenly brother prim popped up on the edge of the pond. Swimming in front of me, I flinched with panic. Brother., take off your glasses and hats off.
" are you worried brother. is smiling at me before I try to climb from the pool to sit next to me. My eyes look around the body of brother dream. The closer it is, the more I see the skin. The detailed white of brother dream that when shattering with the light of oil looks similar to a spark coming out of the brother. The body is tight with the blue swimming pants. In the picture that makes me look so poor, I can't take my eyes anywhere else. Until then, brother. Stares at me with a doubt that I pulled the stig back and turned away the other way.
" No, I don't think. I refuse to be high.
" the child is lying, so it's good to talk I turned to brother Reid who put my face close to me, until my face and brother dream almost hit each other. The two of us stared at each other for a while, so I pulled the stig back. Again and look at the brother-in-law who is now in the same dress, like every night I've ever met brother., looking at me as happy as teasing me. "No, swimming is not" and then brother. Pulled my hand in the pool with my swim, so I wasn't able to swim, so I was going to get out of the water until I drowned. Hold on to me, I'm slowly open my eyes, looking at brother dreamy for trying to keep me calm, and let's be comfortable. Brother Dreamy is holding my hand to swim. I try to move my legs and swim according to brother dreamy. It's like a dream from where I can Now I'm as fluent as a fish. Brother. Takes me to swim. It looks endless. I noticed the little fish swimming around, similar to me, swimming in the sea. I looked after them with the spectacle. Brother.. Look at me and smile happy. I turn to smile for brother dream as well. Brother Goode sigh gently before walking back to the room to coffee, looking after brother Goode, who walked into the room, in her eyes, turned into blue, light blue, running from her eyes to her hand that was tap at The Light Fish Cabinet in the cabinet turned blue immediately, and then it suddenly disappeared when the eyes of the coffee were normal. A new morning, a taxi drove in front of my house, walking down from the car, a taxi drove away, I looked up to the balcony of the lawyer's room before walking into the house. I opened the door to see brother lawyer sitting in the couch with mom.
" Mom... your brother..." I look at both faces with doubt.
" is there something wrong I asked my lawyer and my mom in doubt, mom turned around to talk to me.
" until then.. Brother has been waiting for a long time..
" eat now... what do you have with whey...." I asked the lawyer back with doubt. "huh, go to the sea"
"yes.. Hurry up to collect the clothes"
"why do you have to keep clothes... have to stay overnight?" brother na nod, answer me, do nothing, turn to look at the mother who is in front of the house, mom looks at me and turns to the other way. Time passes, I'm in the trunk Motor Site, brother lawyer, mom stood me in front of the house. "slowly ride, don't rush, it's dangerous"
" Mom can stay I ask mom with concern. Mother Nod, pick me up, grab a hat.
" go first, mom brother lawyer said to mom.
" Let's have a good trip mom said it. The lawyer started the car and rode out right away. Mom looked after both of us before walking into the house. The car, brother lawyer, riding a shortcut to the streets in Bangkok. I need to island the waist. The lawyer is tight. Time passes. The side of the road begins to have a tree. Beautiful. There is a rice field. The lawyer rode the car through the sign. Told the A turn to park in a beach resort, brother lawyer and I take off the helmet.
" my friend's resort I got out of the car. The lawyer walked in. I took a picture of the resort sign and sent the line before running after the lawyer. The two of us walked into the hot, which one sister stood up to smile for us.
" hello me and my brother lawyer. Raise your hand. "169 rooms are on the beach. Tomorrow breakfast starts at 169 to 169, the restaurant will be on the right hand." Brother Lawyer, get the key. "thank you," brother lawyer walked away, I followed, we walked to room 169, I looked in the room, it was a room with a big bed, one bed, there was a rose, placed a heart in the middle of the bed, in the middle of the room Look at the face of the lawyer. "one bed" brother a, I can't do anything right. I'm going to go to the bathroom. "let me go to the bathroom for a while" brother na nod me to walk to the bathroom, brother lawyer, walk the bag and sit down in the bed, look at the room, look happy.
" like it I smile and nod my lawyer.
" will you give me your answer my lawyer asked me to come up with a serious act. I stopped thinking about it. I was slowly facing the lawyer who looked at me with my eyes, begging me to do my heart. Episod 5 will update soon . . Available on LINE TV now! Part If anyone can't wait, see specialclip in line TV. Let's go for a while. Taking brother dreamy to send me to bed. Good dream. All of them. Exclusive First on @linetvth now!